The low temperature overnight was forecast to be 50 degrees F. That’s good sleeping weather for us, so we left several windows open and did not need the furnace and I did not turn on the heater pad on the bed. As I have written the last couple of days I have not been feeling quite right. This morning I had a productive cough. That is never a good thing but it is better than having stuff in my lungs that won’t come out. I was feeling better today so perhaps I am finally kicking out whatever it is that got hold of me. I made our morning coffee and used up the last of the current batch of coffee beans. We have used six pounds of coffee in the last 60 days; a pound every 10 days on average. We left home with eight pounds of coffee from Teeko’s; two pounds each of four different beans/blends packaged in 1/2 pound vacuum sealed bags. I blend pairs of beans in equal proportion when I grind them to make our daily half-caffe morning coffee. We have four 1/2 pound bags left, which will carry us for about 20 more days at our current rate of consumption. We have been vacillating about whether to order more beans from Teeko`s but decided today that we probably should, and do so relatively soon. 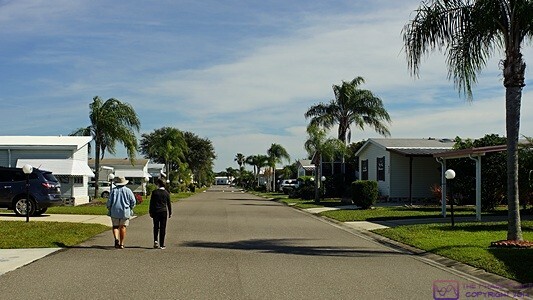 The entrance to Gold Tree MH community in Bradenton, Florida where our friends, Ed and Betty Burns, bought a place after they came of the road as full time RVers of many years. When she returned from her stroll, Linda busied herself with her counted crisis-stitch project. Last night she made arrangements for us to visit SE Florida and the Florida Keys. She zeroed in on February 9, 10, and 11 and confirmed that Mara was willing/able to take care of our cats while we were away. After looking at various options we decided that we wanted to use Homestead, Florida as a base from which to explore the area. One reason was that the prices for lodging in Marathon were $200+ per night and in Key West $400+ per night. We are not late night party animals, so we did not need to spend that kind of money just to have a place we could stumble home to in the middle of the night. The best price she found for a hotel was a well-rated Travel Lodge in Homestead for $109 per night but Trivago would not let her specify a non-smoking room. The Travel Lodge website clearly showed both smoking and non-smoking rooms so we were not about to risk ending up in a smoking room. The next best deal was for a non-smoking room in a Hampton Inn for $160 per night, which includes breakfast. We have always liked Hampton Inns and as a bonus they did not have a reservation cancellation fee. She booked us for the three nights. Our plan is to leave early on the 9th and visit Everglades National Park via the Homestead entrance. We will then check in to the Inn late in the afternoon. On the 10th we will leave early and drive through the Keys, seeing what there is to see along the way, and eventually arriving in Key West. We will get a taste of the Conch Republic but leave in time to get back to the Inn in Homestead at a reasonable hour. On the 11th we might return to Everglades National Park and/explore other things in the area. We will probably sleep in on the 12th, enjoy the complimentary breakfast (as much of it as we can eat), and then check out and head back to Arcadia. While Linda was walking and working on her project I edited seven more blog posts. Late morning I took a break to finish the regeneration of the water softener. I removed the clear housing from the pre-filter housing attached to the inlet on the water softener, removed the diverter tube and flat washer, and returned them to the plastic zip lock bag I store them in. I put the opaque blue housing back on without a filter element inside and ran water through the tank to flush out any remaining salt brine. I tested the water coming out of softener and it was at 1.5 gpg. That was a very discouraging result given that I just used almost 52 ounces of table salt to regenerate it. In the 3-1/2 years we have owned this water softener I have only once successfully regenerated the softener back to zero (0) grains per gallon. Overall it has been a disappointing purchase. It was time to replace the sediment filter ahead of the softener and the carbon filter going into the fresh water tank but we did not bring spare cartridges with us. I took a minute to take several pictures of the caulk that is peeling loose from our new passenger side lower windshield and attached one to a text message to Chuck Spera which resulted in a brief exchange. I then took the car and went on an errand run. My next stop was the local NAPA Auto Parts Store. They had small tubes of silicone adhesive caulk, both black and clear, but I did not buy any at this time. My next stop was the local Shell station where I topped up the fuel tank. I then moved the car next door to the Dunkin Donuts and got a frozen mocha latte made with almond milk. It was warm today and I wanted a treat. Back at our coach I measured our windshield wipers and then e-mailed Brenda Phelan the dimensions so she can send us the correct sun covers along with the tire covers we ordered from her and Bill at the Tampa RV Supershow. With that done I contacted Florida Grande Motor Coach Resort near Webster, Florida to see if we could take advantage of their 2-for-1 special and stay two weeks for the weekly rate. Our current departure date from Big Tree RV Resort in Arcadia is March 7th. Florida Grande was able to take us starting on that date for two weeks so I made the reservation. 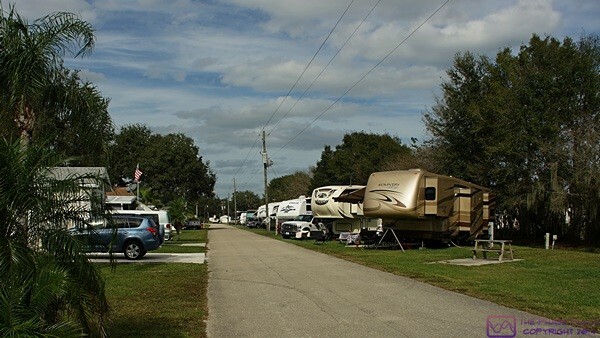 The resort is south of Ocala and The Villages, north of Bushnell, northeast of Brooksville, northwest of Lakeland, and west of Orlando, so it is centrally situated to a part of the state where we can easily spend two weeks exploring and touching base with some friends in the area. With Florida Grande in hand I pulled up the website for Jetty Park Beach and Campground at Port Canaveral on Cape Canaveral. We were hoping that we could get in there when we left Florida Grande. Our GLCC friends, Pat and Vickie Lintner, moved to Jetty Park when they left Fort Wilderness at Disney World in mid-February. They have done this every year for at least the last six years. I visited them there two years ago after dropping Linda at the Orlando airport, so I know it’s a nice little park in a unique location and an ideal place to explore Florida’s Space Coast. The Jetty Park online reservation system indicated that no sites of the type we wanted (full hookup) were available starting on March 21st but said to call or e-mail the office. I knew from my conversations with Pat and Vickie that the park campground was extremely popular with repeat visitors who book their reservations a year in advance. They had also told me that folks occasionally cancel reservations but if I called and checked repeatedly we might be able to get in. I got an answering machine and left my name, cell phone number, and the dates we were interested in. I got a call back a short time later from Scott. He was able to put us on a site for one night on March 21st at the daily rate, and a different sight for seven nights starting on the 22nd, which qualified for the weekly rate. Sold. Jetty Park is a bit more expensive than what we normally like to spend for camping but it is on the Atlantic Ocean between the Kennedy Spaceflight Center and Cocoa Beach. It is also on the south shore of the channel that separates the park from the Cape Canaveral Air Force Station and the Spaceflight facility as well as and a U. S. Navy submarine base. If you are there at the right time submarines can be viewed as they are going into or out of the base. The Port/channel is used heavily by cruise ships, including the Disney Cruise Lines. If the timing is right, rocket launches can also be viewed from there, up close and personal. I was lucky enough to see a military satellite launch when I was there two years ago. My recollection is that it was me and about 10,000 other people, not only in the park but lining the access roads for miles to the west. I remember thinking then that it would be much better to be camped at Jetty Park Campground than fighting this traffic after the launch. Indeed, I crashed (no pun intended) on Pat and Vickie’s sofa for 90 minutes until the traffic dissipated and then drove back to Williston Crossings. I e-mailed Pat and Vickie to let them know we got into Jetty Park Campground and give them the dates. We hope they will still be there for at least part of our stay but even if they have already moved on there is way more to do in the area than we can experience in one week. I then e-mailed Ed Roelle and Bruce/Linda Whitney to update them on our travel plans. With all of that accomplished I returned to working on our water system. I use a sediment filter cartridge in the first housing, which I removed and replaced with the 5 micron cartridge I bought earlier at Walmart. I then unscrewed the housing that is mounted inside the water bay. I had to use my large slip pliers since the filter wrench could not be positioned properly to turn it far enough to loosen the housing. The element that was in there was a specialized cartridge that I bought it in Quartzsite, Arizona this past winter. It was more expensive than most and my recollection is that it contained some silver and had a very small micron rating. We have a 0.5 micron drinking water filter that filters for five different things including cysts, lead, and VOCs, so a whole house carbon wrapped filter on the water input to the coach fresh water tank should be more than adequate. We went for a walk and stopped at the activity building. We were expecting a package from Amazon tomorrow but Pat, one of the resort managers, flagged us down to let us know it arrived today. We picked it up from the office and carried it back to the coach. It was 15 pounds of the Science Diet Sensitive Skin and Stomach cat food, which we could not find locally. For dinner Linda made sautéed kale with garlic and turmeric and vegan quesadillas with Daiya cheddar cheese. Red grapes rounded out the meal, which was simple but delicious. We went for another walk after dinner and then settled in to watch our Tuesday evening TV shows. All of the shows were repeats that did not require our full attention, so Linda worked on puzzles and I worked on this post. The rain started around 2 this morning and intensified through the 4 AM hour before tapering off and ending, temporarily, around 7 AM. We awoke at 7:45 AM and realized it was Wednesday. The weekly coffee at Big Tree Carefree RV Resort (BTCRVR) is Wednesday at 8 AM so we got dressed quickly, grabbed our complimentary coupon, and walked over. As with the last time we went, the place was packed with no seats available as the “regulars” had all arrived at 7:30 AM. They were out of regular coffee so we both filled our travel mugs with what was left of the decaf. We decided not to stay for the announcements and door prize drawings and walked back to our coach. The weather forecast was for the rain to resume late morning and continue until dinner time tomorrow so Linda decided to get a long walk in before the rain returned. While she was out I used my computer to upload two more blog posts. My goal is to get 5 to 7 of them uploaded each day, but after doing two I tired of the task. I don’t feel sick, but I am still coughing stuff up occasionally and I feel a little tired, which I attribute to fighting off whatever ailment I have developed. Jasper, our 11 year old male mackerel tabby cat, started sneezing yesterday and the sneezing became more frequent today. He is eating and drinking, and does otherwise appear to be out of sorts, but we will have to keep an eye on him. Mid-morning I phoned Teeko’s Coffee and Teas back home and ordered eight (8) pounds of custom roasted coffee beans, two pounds each of four different things, to be vacuum packed in 1/2 pound bags. I ordered Ethiopian Yirgacheffe, both regular and decaffeinated, Seattle Blend (caffeinated), and Sweet Dreams, a decaffeinated blend. When I grind the beans just before making our coffee I mix the Yirgacheffe beans 50/50 or I mix the Seattle Blend and Sweet Dreams 50/50 to make Sweet Seattle Dreams. The Yirgacheffe is a single bean coffee, smooth and pure, whereas the Sweet Seattle Dreams is a blend of many beans and is slightly more complex in flavor. We like both so I usually alternate between them from day to day. We left home the day after Thanksgiving Day with eight pounds of the same assortment of beans. At our current rate of consumption of one pound every 10 days our current supply of beans should get us to mid-February, approximately 80 days from when we left to head south for the winter. The new beans will be shipped USPS and should be here in 7 to 10 days. That was the last thing I did of any note for the rest of the day. We were socked in by the weather since we chose not to walk in the rain. Linda worked on her counted cross-stitch project and I took a nap. I eventually got up and played games on my iPad while she took a nap. I laid down a second time and flipped through the various local OTA TV news and weather stations but did not fall asleep. Rainy days are good for that, especially when there isn’t anything else I feel like doing. Eventually Linda made dinner which was a bit of work. She made mujadara, a brown lentil and basmati rice dish with cumin, cayenne pepper, and cinnamon, topped with caramelized onions. It was very good. After dinner we watched the PBS Newshour, which is providing reasonably intelligent coverage of the 2016 presidential campaign and the upcoming Iowa Caucuses. We then watched our usual Wednesday evening PBS nature and science programs. Linda went to bed at 10 PM but I stayed up until midnight to watch Charlie Rose, which I consider to be one of the most intelligent shows on television. I went to bed to the pitter-patter sound of rain lightly falling on the roof of our coach and drifted off to sleep. The rain continued overnight into this morning and intensified between 4 and 6 AM. I was awake off and on starting at 3 but awake to stay by 7. We both got up at 7:30. Jasper, our make cat, started sneezing occasionally a couple of days ago and was sneezing more frequently yesterday and into the evening. We awoke this morning to find blood spattered on the living room floor and a couple of spots on the captain’s chair nearest to the desk. It appeared that Jasper was probably sleeping in that chair when he had to sneeze. We were able to clean all of the blood off of the tile and get the spots out of the chair fabric. The rain quit by 8 AM but it was solidly overcast. The chance of precipitation through lunch time was only 15% but jumped back up to 30% at 1 PM. Juniper, our 7-1/2 year old female cat, seems to be just fine and climbed up in Linda’s lap where she likes to be whenever possible. While we drank our coffee Linda used her iPad to check in on the world and play a few games, while I used mine to finish up yesterday’s blog post and start on today’s post. I decided to call the veterinarian’s office at 9 AM and see if we needed to bring Jasper in. They said we probably should and scheduled an appointment for 12:30 PM. We had granola for breakfast and then got dressed. I settled in at the desk and worked on blog posts for the rest of the morning. The rain was forecast to continue through the day and into the evening before finally clearing out of the area by midnight. There was a bit of a lull during the morning, during which Linda walked over to the dumpster with our small daily bag of kitchen trash and then got in a long walk before returning to our coach. Once she got back Linda worked on her counted cross-stitch project. We put Jasper in his carrier at 12:15 PM and drove the short distance to Desoto Veterinary Services where Dr. McNulty checked him over. His lungs were clear and his heart was strong and normal, but his temperature was elevated slightly. Doc gave him a shot of a multi-acting antibiotic and antibacterial nasal drops. The drops were actually ophthalmological, but he pointed out that anything designed to work in the eyes will also work in the nasal/sinus area as that is where fluids from the eyes end up via the drainage tubes. As long as Jasper was there Dr. McNulty scarped some tartar off of his teeth. I had never seen this done on a cat that had not been anesthetized but Jasper tolerated it quite well. Linda said she had seen our vet back home, Dr. Carron, do this before. In addition to the bill for today’s services we purchased six more doses of Cheristin flea medication. That will cover both cats for February, March, and April until we get home. We will switch them back to Revolution as we still have quite a supply of it and it also protects against heartworm. Before returning to the RV resort we drove to the Turner Agri-Civic Center to drop off our plastic recyclables. By the time we got back to the coach it was starting to rain again. Jasper was glad to be back in the coach and out of his carrier and we glad to be snug in our home-on-wheels and out of the rain. We had a bite of lunch and I resumed editing blog posts but was struggling to maintain my concentration and interest, so I took a nap. 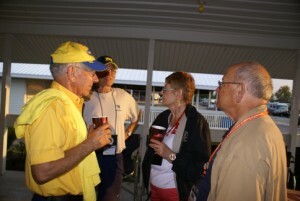 When I got up I checked e-mail and had a reply from Pat and Vickie Lintner. They will be at Jetty Park Beach and Campground at least through the end of March so we will get to hang out with them while we are there. Late afternoon I had a call from Michele Henry of Phoenix Paint. We chat occasionally but this call was promoted by a visit to our website where she noticed that my latest blog post was from early October 2015. She was wondering if I had stopped blogging or if we had, perhaps, stopped traveling. The answers were ‘no’ and ‘no’, of course, but that was just an opening to a conversation, not the end of one. For dinner Linda made tortilla wraps with BBQ pan-seared tofu and caramelized onion and served a side of corn and edamame. I really like this way of preparing tofu but it is messy. I have come to the conclusion that my favorite way to have it is wrapped in a soft, warm tortilla. It’s tasty, and helps contain the mess. After dinner we tuned in the PBS Newshour for our daily dose of presidential campaign nonsense and analysis. We then watched our usual Thursday night CBS TV programs for a brief escape from the bizarre reality of American politics. 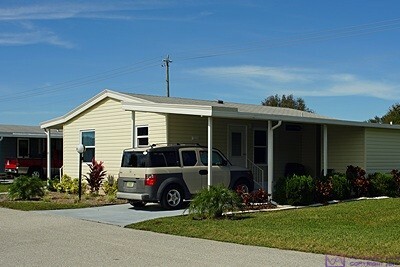 Ed & Betty’s place at Gold Tree MH community in Bradenton, Florida with our car in the driveway. The rainfall over southwest Florida in the 48 hours from late Tuesday evening through late this evening has been epic, and the rainfall totals for the month of January have been historic. Some places closer to the Gulf Coast to our west, southwest, and south received almost 13 inches of rain and most locations received 5 to 10 times their normal rainfall for the entire month. Fortunately Arcadia, in general, and Big Tree Carefree RV Resort, in particular, seem to drain well and we did not have any issues with flooding. Our coach continues to have leaks, however, and while that is frustrating enough by itself, they seem to appear in new places and not reappear in previous locations. This time around the carpet runners on the entry stairs were soaking wet. Besides the leak around the new, and newly installed, passenger side lower windshield, it appears that water has gotten under the new landing platform as the passenger side rear lower corner is water stained and wet. My guess is that water ran down into the stepwell from there but how it got there in the first place is a mystery. Given the problems I discovered with water under the pilot and navigator seats, my guess is that water somehow got to the landing from there, but that only begs the question of where the water gained entry and how it got that far in the first place. Jasper had a difficult night, sneezing often and usually multiple times when he did. As a result I did not get the best night’s sleep. The weather cleared out overnight and in spite of Jasper’s difficulties I did get some rest. I woke around 7 AM to a beautiful sunrise lighting scattered clouds to the southwest. We had coffee, toast, and juice for breakfast, showered, and got dressed. We pulled out of our site at 10 AM and stopped at the Resort dumpster on our way out. We left the Resort about 10:10 and headed west on FL-70 towards Bradenton. We stopped at the Publix supermarket in Lakewood Ranch, just east of I-75, and Linda bought flowers. We arrived at Ed and Betty Burns’ home, just east of I-75 and south of Fl-70, around 11:15 AM. It was great to finally see Ed and Betty again. Since the last time we saw them they have sold their motorhome and bought a manufactured house (double wide) in a nice development in Bradenton, Florida. For lunch Betty had baked a loaf of German Rye Bread and made a pot of vegan vegetable soup from a mix she found. She also had grape tomatoes and orange segments. It was an excellent lunch of good food shared with good friends and we very much appreciated her accommodating the way we eat. After lunch we went for a walk around their gated community and I took a few pictures along the way. We stopped at the clubhouse and pool to check it out. Like the rest of the park they were large, excellent facilities. Back at their house we sat outside chatting and enjoyed some hot tea. It eventually cooled off to where we started to get cold and went inside to continue talking. Rather than go out for dinner we decided to have dinner at Ed and Betty’s. That led Linda and Betty to drive to the Publix supermarket about a half mile from their house to gather ingredients while Ed and I stayed home a opened a couple of bottles of wine. We chatted into the late afternoon enjoying wine and tortilla chips with peach salsa. Linda and Betty started preparing our evening meal at 5 PM. We had a nice salad that included non-dairy Daiya mozzarella style “cheese.” Slices from an Italian baguette with non-dairy spread accompanied the main dish of angel hair pasta with a slightly sweet Ragu pasta sauce. We waited a while and then had dessert of Marie Callander’s Peach Cobbler served hot with Almond Dream non-dairy ice cream on the side. Once again it was a wonderful meal and we were stuffed. We finally left at 8:30 PM and drove back to Arcadia. We stopped to check our mailbox and were back in our coach by 9:45 PM. An episode of Endeavour had started at 9:30 PM and we picked it up in progress. When the episode was over at 11 PM Linda headed to bed and I tuned in Charlie Rose. The temperature dropped back into the 50s last night so we had good sleeping conditions and the coach was only slightly chilly when we woke up this morning. I ran the heating system just long enough to bring the temperature inside up to 70 degrees F and chase away the chill. We had a beautiful day on tap with high, scattered clouds, sunshine, light winds, and temperatures climbing into the 70s. This is why people come to Florida in the winter. After coffee and a light breakfast of grapefruit and toast, Linda went for a walk and I settled in to work on blog posts. She ended up at Walmart looking at swimming suits for me and called me to see what my waist size was. I did not know, and did not want to dig out a tape measure at the moment, so I told her I would go to the store later and find something. The swimming pool here is heated and there is also a hot tub with a whirlpool feature. Both of them are used regularly but we had not been in them yet as the weather has been too cool and/or too wet. I thought it was still too cool today, but Linda was determined to get in the water. When Linda returned from her walk I took the car and drove over as I wanted to top off the fuel tank while I was out. I had measured my waist so I had a rough idea of what size swimming suit I needed. Walmart only had one style that I liked so I bought one, along with a new pop-up nylon mesh laundry basket. When I got back to our coach I tried the swimming suit on. It was huge and needed to be returned. I wanted this swimsuit crisis dealt with now. Linda had bought something that she wanted to return so I took both items and their receipts back to the store. It seems that there are often long lines at Walmart Customer Service counters, but that is just a matter of timing. I did not have to wait very long and the returns were easily accomplished. The problem with the swimming suits at Wally World is that there are gaps in the waist sizes. They had the same style I had previously purchased but the next smaller size looked like it would be too small. Given how much too large the supposedly correct size one was I decided to buy it. I did not have much in the way of options at that point. I tried it on when I got home and it seemed to fit OK. At my urging Linda had already gone over to the pool. I wore a shirt with my swimsuit, put on my Crocs, and walked over to join her. I found her in the pool hanging on to a foam swim noodle and floating around with a smile on her face to match that of any kid. We were both good swimmers when we were kids, but that was a long time ago. I no longer regard water that is deeper than my shoulders as a friendly place. The pool was cool on first contact but I could tell that the temperature would be OK after I had been in for a few minutes. I eventually got all the way in and got my exercise by walking around in water up to my neck while moving my arms back and forth through the water. All movements under water are done against considerable resistance and provide good exercise. When I first got there the sun was still bright and warm but eventually thin clouds started to obscure it. When we were done in the pool we moved to the hot tub, which was quite warm, and Linda turned on the whirlpool pump, which was quite invigorating. When we were done in the hot tub Linda rinsed off in one of the showers to get the chlorinated water out of her hair. I had not gotten my head wet, so I did not bother rinsing off. I had the slight shell of chlorine about me the rest of the day and evening, but it was OK; kind of like a perfume for men. I resumed uploading blog posts until dinnertime. For dinner Linda prepared large salads with mock cold cut slices, garbanzo beans, fresh blueberries, grape tomatoes, and Daiya shredded non-dairy cheese. She finished up the balsamic vinaigrette and dressed my salad with an Asian soy-ginger vinaigrette. We had a couple slices each of the Italian baguette she bought yesterday and it made for a large, tasty, and satisfying meal. After dinner we took our iPads and smartphones to the activity building and used the Resort Wi-Fi to download and install all of our app updates. Linda also downloadable and installed the latest update to the iPad operating system (iOS 9.0.2 I think). Once the updates were done we walked back to our coach and watched another episode of Endeavor, which tells the story of the beginning of Endeavor Morse’ career with the Oxford, England city police department and how he became Inspector Morse. Like most BBC dramas, it is extremely well done. We stayed up and watched an episode of “As Time Goes By”, a delightful British comedy starring Judy Dench. There wasn’t much else on that interested us after that and we turned in earlier than usual. I had the lights out before 11 PM. Today was another pleasant day, weather wise, with light winds and a high temperature in the mid-70s, but more cloud cover than yesterday. Whatever I caught a few days ago is still with me and Jasper is still sneezing, so the boys on the bus are both still a little under the weather. I met Dave Aungier at the Arcadia Rally 2016 and photographed his 1977 MCI MC-5C bus conversion. Dave wrote an article about his bus for Bus Conversion Magazine (long hand) and had his friend Bonnie put it into MS Word. She e-mailed the file to Dave and to me. Other than breaks for lunch and to go for a walk with Linda, I spent most of the day reformatting the article in two columns, doing some minor editing, and then selecting, processing, and inserting photos into the article. I did not finish the work by dinner time and figured I would finish it tomorrow. Linda and Betty strolling down one of the interior roads at the Gold Tree MH community. 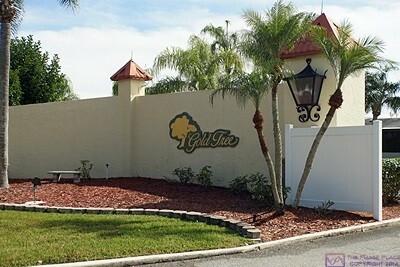 Gold Tree is a clean, well-kept, and attractive gated manuactured housing community with nice amenities. Our friend Mara was scheduled to be at Horizon Coach tomorrow for repairs on a slide out seal and then check into our RV Resort. Her cat, Sabra, has been ill and she decided to push everything out by a day so she can take Sabra back to the veterinarian where she is staying near Ft. Lauderdale. Lunch was roasted red pepper hummus with onion on the dark German rye bread that Betty Burns baked for us last Friday. Double yum. On our first joint walk of the day we found a small group of musicians playing at the gazebo to an equally small audience. The Petanque (p’tunk) and shuffleboard courts were also in full use and there were folks in the swimming pool. Petanque is a form of Bocce Ball that is favored by the Resort residents from Quebec. Linda went swimming later in the afternoon. We had baked potatoes for dinner topped with a sauté of onions, mushrooms, broccoli, and kale. A dollop of Tofutti vegan sour cream added a bit of creaminess. We went for another walk after dinner and stopped by the activity building. The library was full of folks playing dominoes and other folks were gathering for the 7 PM karaoke session. I was done working for the day and settled in with Linda to watch Downton Abbey and whatever else might be on TV this evening. This entry was posted in BCM, Big Tree RV Resort, coffee, Family-Friends-Home, Florida, PBS, Pets-Vets, RV-Travel, Weather, WFPB and tagged 2016 presidential campaign, Amazon Prime, angel hair pasta (vegan), As Time Goes By (BBC/PBS), BCM articles, Bill & Brenda Phelan, Bradenton (FL), Bus Conversion Magazine, Cape Canaveral AFS (FL), Charlie Rose (PBS), Chuck Spera (H3-40 Liberty), David Aungier (1977 MCI MC-5C), Desoto Veterinary Clinic (Arcadia FL), Disney Cruise Lines (Port Canaveral FL), Dr. McNulty DVM/PhD, Ed & Betty Burns, Endeavor (PBS), Everglades NP (FL), Florida Grande Motorcoach Resort (Webster FL), German rye bread, Gold Tree MH Community (Bradenton FL), Hampton Inn (Homestead FL), Homestead (FL), Horizon Coach (Arcadia FL), illness, iPad updates, Jasper (the cat), Jetty Park (Port Canaveral), Jetty Park Campground, Kennedy Spaceflight Center (FL), Key West (FL), Mara Culp, Marathon Key (FL), Marie Callander's Peach Cobbler (vegan), Michele Henry (Phoenix Paint), NAPA (Arcadia FL), NewHour (PBS), non-dairy ice cream (Almond Dream), pan-seard tofu tortilla wraps, Pat & Vicky Lintner, Petanque "Bocce Ball" (BTCRVR), quesadillas (vegan), rain, sauteed kale w/ turmeric (WFPB), Science Diet (cat food), Space Coast (FL), Sunpass (FL Tollroads), Sweet Seattle Dreams coffee blend (Teeko's), swimming pool (BTCRVR), Teeko's Coffees & Teas (Howell MI), vegetable soup, Walmart (Arcadia FL), water filters (H3-40), water leaks (H3-40), water softener regen (H3-40), Wednesday coffee (BTCRVR), Yirgacheffe coffee blend (Ethiopia) on 2016/01/31 by BRF. We got to back to our coach around 1 AM last night but I did not go to sleep until almost 2 AM so we slept in a bit longer than usual this morning. The rally ended at midnight so there was no breakfast or organized activities this morning. I wandered around the rally venue taking pictures of buses as they pulled out or were now easier to photograph because adjacent buses had moved out of the way. The departure of rigs from a rally is always interesting. It is an asynchronous, unmanaged event that is none-the-less generally very orderly. There is never a rush for the exit as RVs leave one-by-one except for occasional groups that are traveling together. Linda strolls along one of the rows of converted buses at the Arcadia Rally 2016. My wandering eventually took me to the north end of the venue where Dave Aungier’s 1977 MCI MC-5C bus conversion was parked. As I had expected the local NAPA store was not open today so David was unable to get the new oil pressure gauge he needed. He did not plan on sticking around until tomorrow to get the part and was basically ready to leave as soon as I photographed his coach. After a brief discussion we agreed that he would pull it out onto the main exit road facing south so I could photograph it in good light and without a lot of clutter around it. I went back to my coach to get my wide angle lens and additional batteries while he moved the bus. After shooting the exterior, bays, and interior we exchanged contact information and Dave was on his way back to his home RV park in Zephyrhills, Florida. Departure day at the Arcadia Rally 2016. After I was done with Dave’s bus I captured a few exterior images of Ronnie and Diann Mewbourn’s 1969 Model 07 Eagle that I was not able to get yesterday. I sat and chatted with them for a bit and gave them my contact information. Although they were not leaving until tomorrow they were getting ready to go explore the area and check out several options for where to camp next. At this point I had taken all of the rally photos I was going to take and went back to our coach to help Linda prepare it for our departure. A late 1940’s GMC bus, with some of its original Greyhound markings, preparing to leave the Arcadia Rally 2016. After having a light lunch we finished prepping our coach to travel and pulled out at 1 PM for the short trip to Big Tree Carefree RV Resort (BTCRVR) in Arcadia. Linda drove the car and followed me over. Once we were in the resort she went ahead of me to find the office and get us registered. While she was doing that two guys showed up in a golf cart. They made a phone call and then had me follow them to the office. From there they escorted me to site #K-2 and got me parked. It was a somewhat narrow back-in site but they got me positioned just right. Linda went back to the office to finish our registration and extended our stay until March 7th. The Holistic Holiday at Sea cruise returns to the Port of Miami on March 5th and we have to pick up Michael and Mara and then get him back to the Tampa airport and get her back to the resort. We will have the 6th to visit with Mara and then be on the move. While Linda was taking care of our registration I leveled the bus and shut it down. I got the shorepower connected but was surprised that the no load voltage on L1 was only 115 VAC and that L2 was even lower at 111 VAC. It was warm and humid but running our air-conditioners with those voltages might be a problem as our Progressive Industries EMS might cut off the shorepower if it dropped any lower. When Linda got back we deployed all of the awnings. A frog dropped from the driver side forward awning onto the grass when we opened it. It was unharmed and hopped off somewhere. While we were setting up we met Ron and Vera, who have the site just south of ours, as they were out washing their trailer. With the voltage at our site lower than I liked I decided not to run the air conditioners. We opened all the windows and roof vents and turned on all three exhaust fans plus an inside fan. We endured a rather warm/humid afternoon with just the natural ventilation, helped a little by a southwesterly breeze coming in the driver side windows. Our coach is parked facing southwest, so we are getting the afternoon sun. Lots of residents walked or rode their bikes past our site. Most waved and/or said “hello” and a few stopped to chat. Conrad and Bonnie visited for quite a while and shared a lot of information with us about the resort and especially its activities, which are apparently numerous. 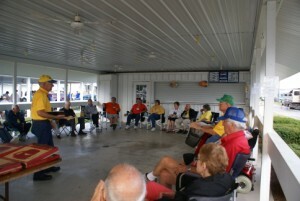 Big Tree RV Resort is a Carefree Resorts property and promotes itself as an active adult community. Early evidence suggested that this might, indeed, be the case. By late afternoon I was tired and uncomfortable so I took a nap. Once the sun dropped below the trees it cooled off enough that we took a leisurely stroll around the resort to get a sense of the layout and the people. We almost always do this when we arrive at any new campground, even if we are only going to be there for one night. Lots of folks were out walking or riding their bicycles. More than a few had strong French accents and we noticed quite a few license plates from Quebec Province in Canada. Back at our rig Linda made vegan pancakes for dinner and served them with fresh blueberries and real maple syrup. We had pineapple later for dessert and a small glass of wine while we watched the first episode of the new season of Sherlock on PBS. Linda went to bed as soon as the program was over. Since I took a nap earlier I stayed up for a while, checked us into the resort on RVillage, and tried to fill in missing information for my blog posts from December 30th and 31st. Eventually I was unable to keep my eyes open and went to sleep. It was very foggy last night by the time I went to bed but had dissipated somewhat by dawn. We slept in and got up at 8:30 AM. Linda got a shower while I made coffee and then I got my shower and trimmed my beard shorter than usual. We had coffee, juice, and granola with blueberries for breakfast and split a banana. After breakfast we drove to downtown Arcadia to visit the farmers market. Although rain was not forecast for today it was misting when we left so we took our rain coats. It was a good thing that we did as the mist got heavier as we got to downtown. There were only a few vendors in the square and none of them were selling fresh produce so we did not buy anything. There was a vendor with lots of pickled products that looked interesting so we may buy something from him at the next farmers market in two weeks. We walked around the block and back to our car and then drove back to the resort on the east edge of town about two miles from downtown. We lost a decorative lug nut cover off of the passenger side of the coach yesterday just after I turned onto eastbound FL-70. Linda looked for it as we drove by but did not spot it. Back at the coach Linda vacuumed the interior, wet mopped the floor, and then went for a walk. 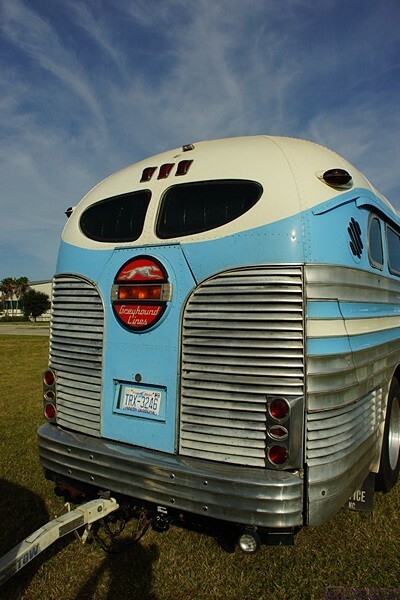 I decided to get a short article written about the Arcadia Rally 2016 for Bus Conversion Magazine while it was still fresh in my mind and before we got busy exploring this part of Florida. First, I transferred my photos from the last few days to my computer and organized them. Next, I set up the folder and sub-folders for the article, opened my article template (Word), and wrote a page of text. I then started selecting and processing photographs and, except for a few breaks, that is what I did for most of the day. When Linda returned from her walk she made a grocery list and then took the car to Walmart. The Walmart is directly opposite the entrance to the resort on the south side of FL-70, which is the main east-west highway through Arcadia. FL-70 is a divided road at this point so to get to the Walmart we have turn right and go west on FL-70 and then make a U-turn, which is legal here, or make a left onto southbound US-31 and then go in the west entrance. To get back to the resort we can exit the Walmart at a traffic light and turn left onto westbound FL-70 and then immediately turn right into the resort entrance. If we are coming east from west of the resort entrance we must make a U-turn at the traffic light in front of the Walmart of a little farther to the east. The traffic signal also serves a much larger residential development just east of the resort and there is a crosswalk, so we can walk to Walmart if we do not expect to have a lot to carry back. When Linda got back and had the groceries put away we had chickpea salad on greens for lunch. During the afternoon I took a break from working on my article to hook up the water softener. Back inside I wanted to back up my most recent photos but my computer could not “see” the NAS. I ended up shutting down everything and restarting it a particular order: WFR, A|W router, NAS, and lastly computer. That reset the connections (IP addresses) and I was able to get back to work. I had been sitting most of the day so we went for an evening stroll before dinner. Back at the coach Linda made a zoodles “pasta” with mushrooms, onions, garlic, broccoli, turmeric, and flax seed. After dinner we decided to do our laundry so we gathered up clothes and bedding, loaded the laundry into the car, and drove it to the resort laundromat, which is located in the same building as the office, library, and activities/meeting room. We loaded four washers and then four dryers. We took our iPads with us and doodled while we waited. There was a good, free Wi-Fi signal at the building so we may take advantage of that while we are here. After the laundry was done, folded, and hung up we watched America Reframed: A Will To The Woods on PBS/2. It was a program about the “green burial” movement and one man’s determination to have a green burial if/when he succumbed to non-Hodgkin’s Lymphoma. He did and got his wish. It was a well done documentary. A cold front drifted southeast through our location yesterday afternoon bringing with it cooler temperatures and an increased probability of rain. We left the windows open just an inch but I closed all three roof vents before we went to bed. We slept in this morning because we did not have any pressing reason to get up. When we did arise I made coffee and Linda eventually fixed toast and grapefruit for our breakfast. Linda needed something that she forgot to buy at Walmart yesterday so she walked there to get it. When she got back she headed out to continue her walk in the resort but the rain finally came and she quickly returned to our coach. Once it started it was persistent and heavy at times. We eventually discovered that the skylight in the hallway was leaking which did not make either of us very happy. I settled in early and spent the whole day working on projects related to the Arcadia Rally. I processed all of the photos of Dave Aungier’s 1977 MCI MC-5C bus conversion and inserted a few of them into a Word doc to serve as an example. I uploaded the photos and the Word document to a folder in my Dropbox and e-mailed Dave the read-only link. I selected and processed a few photos for rally organizers Bill and Brenda Phelan, uploaded those to another Dropbox folder, and e-mailed them the read-only link. I then focused on my article about the rally for Bus Conversion Magazine (BCM), finishing the draft of the print version around 9 PM. I uploaded it to the BCM folder in my Dropbox and e-mailed the publisher, editor, and layout technician. I still need to upload cover and centerfold photos and then select, process, and upload photos for the bonus content section of the digital edition. During the course of the day I took breaks for lunch and dinner. Lunch was a really tasty cannelloni bean salad with capers, olives, lemon zest, raw garlic, and other tasty ingredients. Dinner was a salad of power greens with couscous, cooked beets, blueberries, and orange segments. I also e-mailed Pat Lintner and texted Chuck Spera to see if they had arrived at the Florida destinations. Linda was playing online word games with her sister (Sr. Marilyn) and with Karen Limkemann, and thereby learned that Karen and Steve had arrived at their new place near Venice, Florida where they were busy assembling furniture they just purchased at IKEA. She also exchanged text messages with both of our children regarding our mailing address while we are at Big Tree Carefree RV Resort (BTCRVR) and a few items we needed them to forward on to us. When we checked out the mail room yesterday we discovered that every site at the resort has a cubby and management had already placed a tag on ours with our last name on it. That was a nice touch and made us feel just that much more welcome even though we will only be here for a little over two months. After dinner we turned on the TV and tuned in Part 1 of Ken Burns’ film on Prohibition on PBS/World. We switched to PBS/main and watched the first episode of the sixth and final season of Downton Abby. At the conclusion of the episode we switched back to Prohibition. There was still a chance for rain through tonight, and overnight low temperatures were forecast to drop to around 50 degrees F for the next few nights, so we left the roof vents closed and the windows barely open and went to bed. The overnight low dropped into the upper 40’s last night and made for nice sleeping conditions. As sometimes happens with me when I do not have a clock-regulated schedule to keep, my awake/sleep cycle slowly shifts as I stay up a little later each night and get up a little later each morning. I did not go to sleep last night until after 1 AM and we both got up this morning between 8:30 and 9 to pleasantly cool temperatures in the coach and bright, sunny skies outside. As we were getting dressed we discovered that an old leak in the bedroom was still leaking. The wall just below the front corner of the passenger side window was wet. Linda’s house slippers were stored on top of the OTR HVAC duct cover and also got wet. That’s how we discovered that we still have a problem. Like the other leaks around windows I am convinced that the problem is the way the awnings were originally installed by Royale Coach. They were mounted to the hinged body panels that hold the windows and I think the gaskets for these panels were damaged in the process. Whatever the reason it is very discouraging that we still have leaks in the coach. The other possibility was that the water was getting in around the Fan-Tastic roof vent/fan and then running through the ceiling to the side wall and down. I got our Verizon Mi-Fi/WiFi-Ranger combo online and then made coffee while Linda cooked oatmeal for our breakfast. We doodled on our iPads for a while and I renewed my subscription to the RFinder World Wide Repeater Directory. It was only $9.99/year and they had a holiday renewal special extending it to 18 months. I have this app on my Android-based Samsung Galaxy III Smartphone. My focus for today was to work on the FMCA Freethinkers Chapter website and then unlock the public pages. I received an e-mail from chapter president Bob Pelc recently that prompted me to take care of this and it took most of the day except for beaks to eat and go for a couple of walks, one after lunch and one after dinner. It was a beautiful, sunny day with lower humidity, a light breeze, and a high of 69 degrees F. While walking, we met Gary and Pat a few sites down from us. They came in yesterday and have a house back in Michigan about three miles from ours. It’s a small world. We stopped in the office so I could see it and Pat greeted me by name. Since we had never met that caught me by surprise. She recognized/remembered Linda from when she registered us and made the assumption about who I was. She and her husband, Jim, manage the park. Jim was one of the two guys who led me to the site and got us parked. Pat said she wanted to see our bus and we invited her to stop by anytime. We have overheard a couple of comments and had a few conversations that suggest folks are curious about our bus and word of its presence has spread through the resort. Lunch was hummus and dark leafy greens sandwiches with oranges and grapes. Dinner was pan-seared tofu slices on a bed of dark leafy greens with Asian peanut sauce and apple slices. Both meals were very tasty. I got an unexpected call from Kathy Dewsbury-White, executive director of the Michigan Assessment Consortium. We had not spoken it quite some time so it was a pleasant surprise. After our evening walk we settled in to watch our usual Monday evening TV programs. Having worked all day at my computer I was not in the humor to even doodle on my iPad. We watched the 11 PM news long enough to known the world is falling apart, and switched to the local weather channel (same station) which forecast sunny days ahead. There wasn’t anything on any of the PBS channels we wanted to see so we were in bed and asleep by 11:30 PM. We were up at 7:30 AM this morning. The temperature overnight fell into the upper 40’s and it was 64 degrees F in the coach so we put on our sweats. I made coffee and turned on the Aqua-Hot long enough to raise the temperature to 69 degrees and take the chill off of the interior. We had granola, blueberries, and a banana for breakfast, along with juice, and then doodled on our iPads while we finished our coffee. I renewed my subscription the RFinder World Wide Repeater Directory yesterday and reset my password this morning so I could use the website and Android app on my phone. I searched for repeaters within 20 miles of our location. There appeared to be two in Arcadia but many more west and south of us in Punta Gorda, Murdock, Venice, and Port Charlotte. At 10 AM we took showers, got dressed, and then got to work. 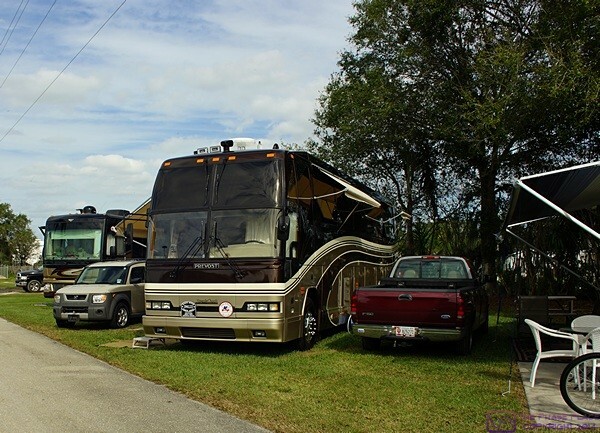 Our bus in its winter 2016 home on site K2 at Big Tree Carefree RV Resort in Arcadia, FL. Linda was checking e-mail and noticed that the PayPal receipt for the RFinder annual subscription had been processed as a monthly payment. It’s only $9.99, but yikes! just the same. I e-mailed the folks at RFinder (Suffolk Systems) and also filed a complaint with PayPal. I knew the folks at RFinder would straighten it out but my complaint was really with PayPal. Their e-mail had instructions for dealing with this that did not correspond to their website. Not helpful. The first order of business for me was dumping the holding tanks and filling the fresh water tank. Once that was done my main focus today was roughing out a featured bus article for Bus Conversions Magazine on Ronnie and Diann Mewbourn’s 1969 Model 07 Eagle bus conversion. They had their bus at the Arcadia Rally last week and I was able to interview them and photograph it. They were there two years ago but I was not able to do an article on their bus at that time. “K” row at Big Tree Carefree RV Resort, Arcadia, FL. Linda took her exercise walk in the morning. When she got back we had mock deli sandwiches for lunch and then went for a stroll around the resort. After our stroll we drove to the Joshua Citrus Company location a couple of miles south of the RV resort. We bought a few things for ourselves and picked up a brochure describing the assortments of fruit they package and ship. We want to ship some fresh citrus fruit to our family members back in Michigan while we are here. While we were at Joshua Citrus I got a call from Bob Greenberg, W2CYK, at RFinder regarding my e-mail and PayPal complaint. He explained what I needed to do to correct the error. When we got back to our rig I canceled the PayPal complaint and then cancelled the subscription (recurring payment). RFinder will e-mail me in June 2017 to remind me that I need to renew. I can set up an annual subscription at that time if I want to. For dinner Linda made black-eyed peas with celery, bell pepper, onion, garlic, and hot pepper flakes. She served it with open-faced Boca “burgers” (vegan) and corn. We went for another stroll after dinner. The high temperature today only reached the lower 70’s, and cooled off quickly after the sun set, so we each bundled up a bit (me more than her) to avoid getting chilled. When we got back to our rig I was done with computer-based work for the day and settled in to watch our Tuesday evening TV programs. After catching a little bit of the local news and weather we both went to sleep. 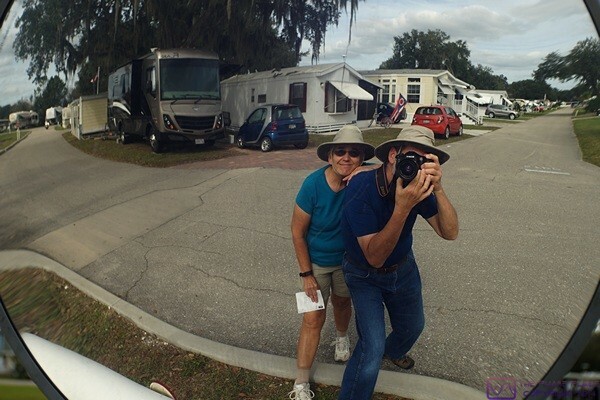 This entry was posted in BCM, Big Tree RV Resort, Digital Image Processesing, Florida, Ham Radio, PBS, People-Events, Photography, RV-Travel, Weather, WFPB and tagged "Zoodles" zucchini noodles, Arcadia (FL), Arcadia (FL) Bus Rally, BCM articles, bedroom leak (H3-40), Big Tree Carefree RV Resort (BTCRVR), black-eyed peas with veggies, Bob Greenberg (W2CYK RFinder), Boca burgers (vegan), cannelloni bean salad, Chuck & Barbara Spera, computer network (H3-40), Conrad & Bonnie (BTCRVR), Dave Aungier 1977 MC-5C, Downton Abbey (PBS), Farmers Market (Arcadia FL), fresh water tank (H3-40), Gary & Pat (BTCRVR), green burial movement, Joshua Citrus Co (Arcadia FL), Kathy Dewsbury-White (MAC), low voltage (BTCRVR), pan-seared glazed tofu (vegan), Pat & Vicky Lintner, Paypal, rain, RFinder repeater directory, Ron & Vera (BTCRVR), Ronnie & Diann Mewbourn (1968 Model 07 Eagle), Sherlock (BBC/PBS), skylight leaks (H3-40), Steve & Karen Limkemann, Turner Agri Civic Cntr (Arcadia FL), Walmart (Arcadia FL), Waste Tanks (H3-40), Winn-Dixie (Arcadia FL) on 2016/01/05 by BRF. The temperature at midnight was a little warmer than we like for sleeping but still OK. The humidity was high, however, and everything felt slightly damp. There was a high likelihood of rain before sunrise but we left the windows and roof vents open and all three exhaust fans running. We have air conditioners but they are noisy and use a lot of electricity so we do not use them unless we have to. Mostly, however, we like fresh air and tend to resist closing up the coach. We were both asleep by 11:30 PM last night and I was up a 6:50 AM this morning. I fed the cats and then watched a TV program on WUFT’s Create channel called Florida Crossroads. It was on Florida’s Black Heritage Trail and featured some of the off-the-beaten-path museums and historically black communities in the state. As the program pointed out at the beginning “If you head down I-75 to Disney World and other Florida attractions you won’t see these places.” We do not have any plans to follow this trail but the show reminded me that every state has a history that is preserved in out-of-the-way places and it takes time and desire to seek them out. Linda got up about half way through the programs so I watched the last 15 minutes of the show and then turned off the TV. The rain increased from a light drizzle to a light rain and Linda pulled up the weather radar on her iPad. Moisture was streaming northeast from the Gulf in our general direction so I closed the ceiling vent/fan in the bedroom. It is over the foot of the bed so if water gets in the bedding gets wet. I left the other two vent/fans open and exhausting on medium speed as no water seemed to be coming in. They are both directly above vinyl tile flooring so if water did get in it would be easy to clean up. I made a very full pot of coffee, using up the last of our first batch of Sweet Seattle Dreams beans (Seattle Blend and Sweet Dreams decaf blend, both from Teeko’s Coffee and Tea back home). The Kindle edition of Dr. Michael Greger’s new book, How Not to Die, was available so Linda initiated downloading it to our various devices. We both opened the Kindle apps on our iPads and finished downloading it to our devices. We had English muffins and split a grapefruit for breakfast. Once we were dressed and the kitchen was cleaned up Linda packed up Madeline’s Christmas stocking, took it to the Post Office, and mailed it. While she was there she bought holiday stamps including the postage needed to get our Year in Review holiday letter to friends in Ontario. With the Habitat For Humanity and Webasto Burner Service articles wrapped up (for now) I felt like taking a break from computer-based work but there was too much that still needed to be done. At the top of the list was finalizing plans to get together with Bruce and Linda, John and Marian, and Al this week or next. That was all being done by e-mail so it was spread out through the day but I eventually got the visits planned. I need to work on the FMCA FTH and GLCC websites, and at some point I need to start writing, or at least outlining, new articles based on the work we did to the interior of our motorcoach this past summer and fall. But the task rising to the top of my list is the blog, now over four months behind. First, however, I installed the Twenty Sixteen WordPress Theme on our personal site (this one) just to have a look. It’s a nice, clean, blog oriented theme, with features that make it more responsive with respect to sizing images on different devices but I did not switch the site over at this time. I spent the rest of the morning copying blog post drafts from e-mails to Word docs and then editing the ones from August to get them ready to upload. I was able to upload posts for August 3 through 8, including a gallery post of the refrigerator swap at Chuck’s shop on the 8th. I spent the rest of the day selecting and processing photos for the rest of August. Our storage ottoman was scheduled for delivery by 8 PM last night but the office closed at 5 PM and it wasn’t here by then. Amazon notified us that it was delivered today so Linda retrieved it from the office when she made a quick trip to the Grocery Depot for ingredients to make polenta for dinner. With more light rain forecast for this evening we went for a late afternoon walk. We got to the northwest corner of the resort and were hailed by Elliot and Jamie who we met at the campfire on Saturday evening. This is their first winter at Williston Crossings and they are enjoying it, especially the variety and frequency of available activities. We started to get a few raindrops while we were chatting with them and headed back to the rig at a quick pace. It was misting by the time we got there but we did not get very wet. Linda started working on dinner by making the polenta and putting it in the refrigerator to firm up. I turned on the TV for background noise and doodled on my iPad. Linda set out our salads and then we had a 20 minute break before the polenta was ready. She served it with Puttanesca sauce that included cayenne pepper and had a nice kick. After dinner we watched our usual Tuesday evening TV programs, all of them season finales, and then went to bed. 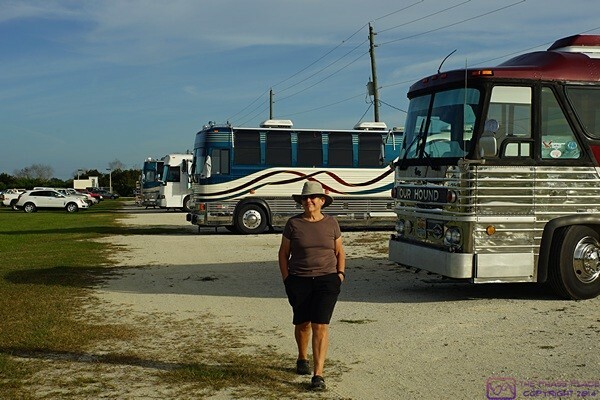 This entry was posted in BCM, coffee, Culture & Entertainment, Family-Friends-Home, Florida, PBS, RV-Travel, WC-RV-Resort, Weather, WFPB and tagged 15x15 storage hassock, air-conditioning (H3-40), Al Hesselbart, Bruce & Linda Whitney (AROs), Chuck's bus garage (Novi MI), Elliot & Jamie (WCRVR), English muffins (vegan), Florida Crossroads (PBS Gainesville), Forida's Black Heritage Trail, fresh air, fresh grapefruit (WFPB), HFH article (BCM), How Not To Die (Dr. Greger), John & Marian Hagan, Kindle (iPad), Michael Greger MD, pan-fried polenta w/ puttanesca sauce (vegan), rain, Sweet Seattle Dreams coffee blend (Teeko's), warm & humid, webasto service article (BCM), website/blog, Year-In-Review letter (2015) on 2015/12/15 by BRF. I turned the lights out at 11:30 PM last night so I was starting to wake up at 6:30 AM this morning and finally got up at 7 AM. We have had light to moderate fog the last few mornings which always coincides with very still air. It is a calm, quiet time to gaze out over our own personal “misty moors” and appreciate where we are and the lifetime of work that got us here. Linda was still sound asleep so I closed the bedroom door to shield her from the noise of the coffee grinder. That was probably unnecessary as she was sleeping with her good ear down, but I did want to wake her prematurely. I ground up 8 scoops of the Cafe Europe (reg) / Columbian (decaf) blend which yielded nine scoops of grounds. I have figured out over time that to make 9 cups of coffee takes about 10 cups of water as that quantity of grounds absorbs and holds almost a cup. (These are 6 ounce coffee “cups,” of course, not real 8 ounce cups.) More importantly the strength of the coffee seems to come out right. Once the coffee was brewing I washed out the grinder reservoir and wiped out the grinder. It seems to hold coffee grounds as if they were magnetic and being relatively fine particles they get into all of the small nooks and crannies. Why a coffee grinder has small nooks and crannies is one of those product design questions that suggest the designer(s) never actually used their product for its intended purpose. My main reason for getting up early was that it was no longer comfortable to stay in bed. My lower right back has been sore for over a week now and is worse when lying down than when working, much of which has been on my hands and knees. My secondary reason for arising early was that I wanted to get an earlier start working on the bus today. We need to finish the dry layout of the vinyl tile floor today so I can apply the adhesive tomorrow, with Linda’s help, before we have Madeline for the weekend starting Saturday sometime. I assumed my usual position on one of the living room sofas with our male cat, Jasper, at my right side, and quietly enjoyed my coffee while doing some online research and starting this blog post. Speaking of which, I am now (once again) over six weeks behind in uploading posts to our blog. By the time we are done working in the evening and have had dinner I need what little time and energy I have left to write the draft post for that day. Uploading them is a whole different process that also takes time and thought. I am determined, however, to be caught up before we leave for the winter and to post daily while we are away. Being behind is not fun for me, and posts that are 4 – 8 weeks old are probably not interesting to anyone who might read the blog. I need a very specific trowel, an Armstrong S-891, to apply the Armstrong S-288 vinyl tile adhesive. As I mentioned in yesterday’s post, The Home Depot and Lowe’s do not sell this trowel or one even remotely similar. Lowe’s did, however, have a plastic spreader that has the correct notch size and spacing. Someone in the floor department at one of the stores suggested we try Blakely’s Supply in Wixom so I plan to call them this morning. Don at Lynch Carpet in Howell, where we got the tile and adhesive, mentioned another place so I may have to call them back and get the name of the business. I called Blakely’s at 8:30 AM. They do not carry Armstrong products but they did have a trowel that matched the specifications of the S-891. They had one in stock so I asked them to hold for me. With the Labor Day weekend almost upon us we decided to drive to Wixom and buy the trowel before busying ourselves in the bus. The round trip would have taken an hour but we went to The Home Depot in Howell before returning to the house and bus. This particular Home Depot has a tool rental operation and we wanted to see if they had a 100 pound floor roller. They did. In fact, they had two of them; $22/day (24 hours). If I call before they close tonight they will hold one for me to pick up in the morning between 6 – 8 AM. By the time we got home we were finally a little bit hungry and had our usual breakfast of homemade granola with fresh blueberries and banana. Thunderstorms were forecast for today so we brought the saber saw into the bus so we would not have to walk outside to the garage to use it. We resumed working in the bathroom and got all of the tiles for that space measured, cut, and fitted into place. We then continued from the hallway into the bedroom and up the front side of the bed towards the driver’s side of the coach. It seems that our pace has slowed yesterday and today but that’s not really the case. What has happened is that all of the pieces have to be cut, some of them along four or five lines that cannot all be scored and snapped, and we are working in a much more confined space that makes it difficult to make accurate measurements. By 3:30 PM we were part way down the foot of the bed and decided to take a lunch break. Linda made sandwiches on toasted rye bread with vegan deli slices, onion, tomato, and lots of power greens. She chatted briefly with our son about arrangements for this weekend and then we got back to work at 4:30 PM. The rain that had been forecasted for most of the day finally arrived but did not affect our work as we had everything inside that we needed. We worked until 7 PM and finished the floor tiles in the bedroom. That left five or six pieces to be cut at the front where the main floor and cockpit meet. My sister called and I said I would call her back when we were done. We figured it would take at least an hour to finish these pieces. We were tired and hungry and decided to defer this work until first thing tomorrow morning. We shut off the air-conditioners, turned off the lights, and locked the bus. While Linda prepared dinner I cleaned the cat’s litter tray, checked my e-mail, and replied to one from BCM. Dinner was fresh steamed broccoli, whole grain bread, and mock chicken with orange sauce. Another Gardein product, the “chicken” was very tasty. I called my sister back after dinner and we had a long chat which wrapped up just before 10 PM. Linda and I went to bed and settled in. I was finishing up this post around 11 PM when it started raining. From the sound it was quite a downpour but it did not last even 15 minutes. This entry was posted in Bus Projects, Family-Friends-Home, RV-Travel, Weather and tagged Armstrong luxury vinyl floor tile, Armstrong S-288 vinyl adhesive, Armstrong S-891 adhesive trowel, Blakely's (Wixom MI), floor tile (H3-40), floor tile dry fit, Home Depot tool rental (Howell MI), interior remodel (H3-40), La Plata Creme Fresh (Armstrong Alterna), mock chicken w/ orange sauce (Gardein), mock deli slices on rye (vegan), morning fog, rain, sore back (Bruce), steamed broccoli (WFPB) on 2015/09/03 by BRF. We have a doe and her spotted faun that have been coming in the early morning to the deer block we set in our back yard the other day. They were there again this morning and the block is close enough to the house that we got a good look at them through the bedroom doorwall. They must be comfortable with the setting as the faun wandered off towards the western part of our property and the doe let it go while she continued to lick the block. Eventually, however, the faun was out of sight and the doe headed off in that direction to find it. We had cinnamon raisin toast and soy yogurt for breakfast, with orange-grapefruit juice to wash down the vitamins. I used up the last of the Sweet Seattle Dreams half-caff coffee beans for our pot of morning coffee. Keith usually mows our grass on Mondays and he came to the front door around 9:30 AM to ask if we wanted it cut this week. That’s the first time he has done that this summer but it was an appropriate and timely question. We have had very little rain the last couple of weeks so the grass had not gown much since last Monday and was a little brown in places. We agreed to skip this week, which I think was what Keith was hoping I would say. There was a high probability of rain starting around noon and I suspect he had another yard he wanted to cut before it started. We have been very busy the last few days and I have not had time to do more than outline my blog posts. Linda needed to work on an analysis for the bakery so I spent much of the day filling in the details of my recent posts. Our days are very full and if I wait too long I cannot capture them accurately. Linda looked up the information on the DTE Energy “Energy Efficiency” appliance recycling program. I called the 866 number and was assisted by Reginald. The earliest available pickup date was Friday, August 28 so I took that. It took quite a while to arrange the pickup but Reginald appeared to get all the pertinent information and give me a confirmation code and a phone number to reach the truck on pickup day. Once the refrigerator pickup was arranged I texted Chuck to let him know the details. That prompted a return phone call and a conversation about refrigerators. Having seen how our swap went on Saturday he and Barb are also thinking very seriously about replacing the refrigerator in their bus. The rationale is the same as ours; the fridge is old, so it is noisier and less efficient than newer ones, and having it break on the road would be more than inconvenient. Replacing a refrigerator in an RV, especially a residential unit in a bus conversion, is not like replacing one in a home. Access is a major problem and there is not a lot of space to maneuver it or get more than two pairs of hands on it. If they replace theirs here (in Michigan) their bus will be inside their garage/shop, the forklift will be available to do the heavy lifting, and trusted friends and family will be available to help. And, most importantly, they won’t be living in it and dependent on the fridge for preserving their food. Before the day got away from me I pulled up the PDF of the manual for the wireless keypad for the large garage door. When I installed the new opener for the small garage door and reprogrammed the wireless remotes for our cars I inadvertently rendered the keypad inoperable. Reprogramming it was simple enough once I had the procedure. It’s the small, simple tasks like this one that become big burdens if not taken care of in a timely manner. The predicted rain started around noon and was steady until 3 PM. It was just the kind of rain we needed; gentle enough to give it a chance to soak in but hard enough to provide a useful quantity of moisture to the ground. Six to 10 hours of this would have been even better but we were glad for what we got. I had thought that we might mask off the inside of the coach today with painter’s plastic but with the rain and humidity, and plenty of other things to do, I decided to defer that until tomorrow. During the afternoon Jarel texted me a couple of pictures and a brief status update on our custom woodworking projects. Not surprisingly he is already well along on the construction of the pull-out pantry and has spray lacquered the pieces for the built-in sofa. One of the photos showed one of the 1/8″ thick aluminum plates that will form the side rails for each shelf in the pantry. He applied a brushed finish to the plate and countersunk the screw holes so the heads would not protrude beyond the surface. Jarel did metal work at one time before he became a cabinet maker so he knows how to do this kind of stuff. He is also meticulous and takes great pride in his work. Given a choice I would always prefer to hire a craftsman who cares as much, or more, about the quality of their work as I do. When I know I am going to have a long full day, such as this coming Wednesday, I will try to “write ahead” on my blog, basically outlining the plan for the day but obviously not filling in the details of things that have not yet happened. Along the same lines, I often use future blog posts as a planning tool. As things occur to me that I need to do I will note them in the draft of a future post. If the thing actually gets done on that date I flesh out the details, and if not, I move it to a new date. I think I did several loads of laundry today and spent some time editing and uploading blog posts during the evening, but as I am finishing this post later in the week I have lost the details and will just end here. This entry was posted in Accounting, Bus Projects, coffee, Family-Friends-Home, Professional, Projects, RV-Travel, Weather, WFPB, WordPress and tagged backyard wildlife, blog post drafts, built-in sofa (H3-40), Chuck & Barbara, Chuck Spera (H3-40 Liberty), cinnamon raisin toast (vegan), DTE Energy appliance recycling, Garage door opener remotes (Chamberlin), Jarel Beatty Cabinetry (Logansport IN), Keith Kish Lawn Care, laundry, pull-out pantry (H3-40), rain, refrigerator recycling, refrigerator swap (H3-40), soy yogurt (vegan), Sweet Seattle Dreams half-caff (Teeko's) on 2015/08/10 by BRF. It rained long and hard all day yesterday and into the evening past bedtime. Today brought more rain, though not as hard and not quite as persistent. Although we have low spots around our yard that turn into small temporary ponds when we get this kind of rain we are not in an area that is prone to flooding. That’s because we live just south of the boundary between two watersheds–the Huron River to the south and the Shiawassee River to the north–so water tends to flow away from here, eventually. Phil (Best Precision Grading) stopped by around 10:30 AM to look at the pull-through driveway he built for us last year. He said it looked solid enough to drive the bus on it, but was obviously no longer level and had a low spot in front of the new front stairs. He will need a half day and a small load of 21AA road gravel to repair the damage done by Village Landscape Development while building our front stairs and sidewalk. The cost won’t be too bad (although it shouldn’t have cost us anything) but getting him to find the time to come do it could be a challenge. He’s had a busy summer and suffered the same delays as other contractors who do outdoor work due to the wet spring and summer we’ve had. He was also here to see the work Village Landscape Development had done. He agreed that the hardscape work looked good but the grading in the rear did not look right and the tracks in the yard from the equipment had not been raked out properly. He suggested I let the grass grow in and the ground dry out before assessing whether anything needs to be done. He also looked at the west end of our property, which sits lower than the east end where the house is located. The timing of his visit was good as all the low-lying areas had water standing in them, allowing him to see clearly the exact nature of the (lack of) drainage problem. His suggestion was a “French drain.” Basically it’s a trench that is shallow at the far/high end and gets deeper as it goes towards the place where the water needs to end up. Plastic drain tile, the kind with perforations and a nylon “sock” covering, gets laid in the trench and then the trench is filled to grade with pea gravel. The dirt that came out of the trench gets spread around to cover the pea gravel and blend in to the undisturbed soil on either side. We had tofu hot dogs for lunch and then Linda left to meet up with Diane to see a movie (Boyhood) and then go out to dinner at Bahama Breeze. I stayed home and worked at my computer, taking a break mid-afternoon to make popcorn. The worst weather of the day was happening at that time, so I stayed upstairs for a while and read the new 2nd edition of The Mobile Internet Handbook that I had just downloaded this morning. I worked until 7 PM and then stopped to have a light dinner consisting of chickpea spread on whole grain toast and half of a small watermelon. Linda got home as I was finishing my watermelon. In spite of AT&T switching our phone and DSL service to all new wire pairs our Internet service went out occasionally throughout the day and evening, although it usually returned quickly. I think the sad truth is that their landline infrastructure is not as tolerant of wet weather as it should be and most of their money is going into expanding cellular service. We had the same problem over the years at our house in Farmington Hills. This entry was posted in Computers, Family-Friends-Home, Projects and tagged AT&T POTS-DSL, Bahama Breeze, Diane Rauch, driveway repair, final grading, French drains, Huron-Shiawassee watershed boundary, Mobile Internet Handbook (2e), Phil Jarrell (Precision Grading), popcorn (vegan), pull-through driveway, rain, tofu hotdogs (vegan), Village Landscape Development (VLD), watermelon (WFPB), west property on 2014/08/12 by BRF. We had a long day of work today. We were up just after 7 AM, had a light breakfast of toast, fruit juice, and coffee, read a few blog posts, and got to work. My first task was to apply a second, light coat of drywall compound to all of the divots in the wall. Our main morning task was the installation of the fold-down ladder for the garage attic. It was definitely a two-person job. Per the instructions, we installed temporary installation boards to support the assembly while we secured it in place. The installation required one of us to be in the attic and that job fell to me. We put the assembly on top of a plastic shelving unit to get it close to the ceiling. Once I was in the attic with all of the tools I would need, including a headlamp, Linda slid the shelving unit so the assembly was directly under the rough opening. It was still too far from the ceiling for me to reach from above so she placed two footstools under it. I was then able to reach one end from above and pull it up into the opening while she lifted the other end into position from below. We read and followed the directions carefully so we already had the pull string and T-handle installed. That allowed Linda to move the plastic shelves out of the way, carefully open the door from below, and position the step ladder. I dropped her the cord for the worklight and then had enough light to work comfortably. We temporarily secured the unit with deck screws. They were cheap screws and the heads tended to strip easily, but we got them in far enough to hold the unit in place while I installed the lag screws. The 10 lag screws got installed through pre-drilled holes, six of which went through metal hinge plates. The instructions said to drill through these holes into the trusses and headers, but the folding ladder hardware made that difficult, and my drill buts were all a bit short to do much. By cutting the zip ties and partially unfolding the ladder I was able to get all 10 lag screws most of the way in with my drill. They all had to be shimmed. The final tightening was done with a socket and ratchet. We took a break for lunch around 1 PM and had leftover miso soup, tofu hot dogs, and fresh apples. I made a quick run to Lowe’s to get some additional electrical parts I needed to install lights and a light switch in the garage attic. While I was there I also bought a baby gate for our basement stairs. Up until now we have blocked the landing for the basement stairs with a couple of chairs when grand-daughter Madeline has come to visit. Now that she has successfully spent the night at our house we anticipate many more such visits and wanted a more permanent solution. The device I bought had a gate with a latch. It was designed to be installed under tension, but the directions said it had to be anchored to the walls if used at the top of a flight of stairs. We were not thrilled about mounting it to the walls, but we did. The installation took about an hour to complete. Back in the garage I found an old, unopened drywall sanding/finishing sponge. It had a 1/4″ thick coarse pad on one side for sanding. The regular sponge side was used to wipe off the drywall and slightly wet the areas to be sanded. I let the sanded areas dry, wiped everything down, and applied a coat of white exterior semi-gloss to the area of the two existing walls and the ceiling that will be inside the utility closet. The probability of rain rose steadily though the day and finally resulted in thunderstorms around 4:30 PM. Steve said yesterday he would be here today and I tried to get him to understand that based on the forecast he needed to be here early. He wasn’t. He showed up with the excavator about an hour after the rains, by which point the retaining wall work site had turned to mud. He took the excavator back there anyway and we watched him work while we had dinner, which consisted of a very nice green salad with strawberries and the rest of the Pad Thai from last night. (Even left over it was still exceptional.) He was moving boulders and a lot of dirt trying to get rid of the small mountain range that blocked the flow of water away from our lower deck and was spreading the dirt around in an effort to create some of the final grading. He brought a helper with him and they had long lengths of drain pipe that I think the intended to install. But the skies darkened, the rain started, the wind came up, and the warning sirens came on. He shut off the machine and the two of them made a run for their truck and left. More rain is forecast for tonight with a chance of thunderstorms, possibly severe. The probability for rain on Tuesday is currently 60%, and stays at 40% through Wednesday. At this juncture it appears that they won’t get much work done here this week, and their machine may be stuck here until it dries out. After dinner Linda and I finally built the base for the platform where the library HVAC unit will be installed. It’s a 40″ deep x 46″ wide box with center cross bracing. It’s made of pieces of 2 x 12 on edge. We set it in the northeast corner of the garage, leveled it with shims, and secured it to the studs in the walls with 3.5″ nails. I had to make all of the cuts with my Rockwell 8″ circular saw as the chop saw won’t cut something that wide. I did not cut the plywood platform as I need to install it after the new (west) wall of the utility closet is in place so I can nail through the base into the wall studs. I will, however, cut the plywood tomorrow before the wall is built as I will be able to set it on the base and trace around it on the underside to get a perfect fit. My goal for tomorrow is to cut the platform, build the west wall, set it in place and anchor it, and install the platform. Linda has a 12:30 PM dentist appointment, so I will have to do most of this work by myself. By that point I will need to get cleaned up, shift gears, and get ready for a 4 PM FMCA Education Committee work session. This entry was posted in Family-Friends-Home, Projects, WFPB and tagged apples (WFPB), baby gate, drywall work, fold-down ladder, garage attic, HVAC platform, interior painting, MEF3, miso soup (vegan), Pad Thai (vegan), rain, Steve (VLD), strawberries (WFPB), thunderstorms, tofu hotdogs, wind on 2014/07/27 by BRF. I awoke this morning to the sound of light rain which had started sometime during the overnight. The landscapers were supposed to be back first thing this morning to continue working on the retaining walls in the back, but the rain had made the work site muddy enough that I figured they would not be here today, which turned out to be the case. The clouds cleared off by mid-morning and by early afternoon the site had dried out enough that they could have continued with the hand work. With tomorrow being a holiday, however, I did not expect them to begin their workday at 1 PM. After we had breakfast I left around 10 AM to drive to Adams Distributing in Novi to return a pair of battery chargers. 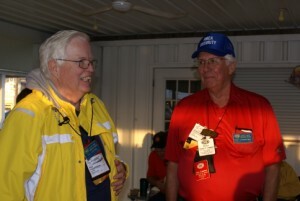 I visited with Scotty (AC8IL) for a while discussing his ham radio setup. Since getting back into the hobby after many years he has done very well making DX (long distance) contacts all over the world. I got back around 11:30 AM and our son and grand-daughter showed up shortly thereafter. Today was Brendan and Shawna’s third wedding anniversary and we all agreed it was an opportune time for Madeline to have her first sleepover at our house, allowing her parents some much needed adult only time. Brendan brought the porta-crib and portable stroller, and transferred the car seat to Linda’s car. Brendan visited until it was time for Madeline’s nap and left once she was asleep. Madeline had a good long nap and woke up refreshed and ready to go. And go she did; we played with toys, read books, explored the main floor of the house, and went for an explore in the yard. We have a five acre parcel, so it was an extended exploration. For dinner, Linda cooked some Dr. Praeger’s vegan burgers and served them with sliced parsnips with sautéed in a small amount of water and quinoa with dried cranberries. Madeline enjoyed all of it, along with some peas and strawberries. I have not had parsnips very many times in my life. When sautéed they taste like slightly peppery cooked carrots, which tend to be sweet. We had more play time after dinner until 7:30 PM when Linda got her ready for bed and she had her evening bottle. She was tucked in her porta-crib at 7:45 PM and quickly drifted gently off to sleep. Brendan also brought their baby monitor and set it up, so we were able to keep an eye on her without opening the door to the bedroom and possibly disturbing her. We stayed up a little while longer and then turned in around 9:30 PM to watch another episode of Doc Martin. At 10:12 PM we lost power for a few seconds and a minute later it happened again. We received a couple of e-mail notifications from our standby generator regarding the loss of utility power but never got one indicating that the generator had started. Apparently the outages were too short to trigger the start sequence. Even though most of the critical electronics in the house are connected to uninterruptible power supplies, I got up and shut down all of the computers, NAS units, and the laser printer. The power flickered a couple more times but we never lost our Internet and were able to watch the last 10 minutes of Doc Martin. Our last message from the generator indicated that it would stop notifying us of the situation until the fault had cleared for 24 hours. The generator ran a successful self test at noon today, as it does every Thursday, so I was confident that it would start if needed. We had a power outage while we were away this past winter during which the generator started and the automatic transfer switch transferred the house to the generator, so I was also confident that all if this would work if needed. The worst part of this kind of momentary power outage is that the UPS units all start beeping (an alarm) as soon as they lose AC power. It’s kind of like a smoke detector or other alarm going off; it tends to jolt you awake and once up it is hard to go back to sleep as you lie there anticipating the next alarm. This entry was posted in Family-Friends-Home, Ham Radio, WFPB and tagged Adams Distributing, APC UPS, Brendan, Doc Martin (PBS), Madeline, MEF3, Network Attached Storage (NAS), power blips, quinoa with dried cranberries, rain, sauteed parsnips (vegan), Scott (AC8IL), vegan burgers, whole house generator on 2014/07/03 by BRF. The morning was cool with temperatures just above 60 degrees F and a thin layer of high clouds. I was tempted to work in the yard trimming low branches off a few more trees but today was supposed to be lawn care day and it did not make sense to create a mess. That was Linda’s argument, anyway, and it sounded right to me. Besides, the chance of rain was 0% until noon but then jumped to 60%, and the radar showed a band of storms moving out of Wisconsin over Lake Michigan and in our general direction. Keith always mows our neighbor’s yard first, starting around 9 AM. The first raindrops fell around 11AM. He got part of our yard mowed but by 1 PM there was a light, steady rain, causing the grass clippings to clump and making him less than comfortable, so he called it quits for the day. While not the steady, heavy rains of a true monsoon, late spring this year has been persistently wet. I chatted briefly with Steve from Village Landscape Development this morning. They have continued to be delayed in finishing projects by the recurring rain. His newest ETA for our job was Wednesday (this week) but he was not aware of the rain that was expected for today and tomorrow. I figure Wednesday next week; maybe. We were sitting on the back deck enjoying our morning coffee and decided to look for some information on our Mugo Pine. It turns out that our Mugo pine isn’t a Mugo pine after all; it’s a dwarf weeping Norway spruce. I trimmed off a dead branch yesterday and this morning discovered that it was the right thing to do, so no harm done. In the future I should probably follow the corollary of the carpenter’s rule: research twice, cut once. Linda had an appointment with the dentist this morning to have her broken molar prepared for a crown. She left mid-morning for the 50+ mile drive to Dearborn and stopped at the mall on her way back. Between the time needed to make the crown and her upcoming jury duty she won’t be able to go back until late July to have the crown installed and all of the other work done that was postponed so the broken tooth could be dealt with last week. Several weeks ago I bought a replacement handle and lock set for the front storm door but did not get it installed right away. It was not a perfect fit so installation required modification of the door frame. I’ve been putting it off but today was finally the day to get it done. I had to drill new holes and enlarge existing ones, which never works well. I did not get the holes in exactly the right spot the first time, which required even more drilling and enlarging. I stayed with it and eventually got the hardware installed and working the way it is supposed to. The trim pieces cover all of the holes, so none of my modifications are visible and the door looks fine. I spent the afternoon at my desk catching up on posting entries to our blog and working on tasks related to several RV clubs we belong to. I also downloaded documents and videos related to our role as RVillage Ambassadors. The second teleconference meeting of the FMCA Education Committee today was at 4 PM, and I sent a short e-mail summary of my findings regarding the RV Trip Wizard website in advance of the meeting. The meeting lasted 80 minutes and we had a good discussion. We rarely go out to dinner anymore. Besides avoiding the expense, eating at home affords us a much greater variety of ingredients prepared as healthier dishes with appropriate portions. Tonight was an exception, though not for any exceptional reason. Linda looked a little tired and I figured she didn’t feel like cooking, so we went to the La Marsa restaurant in Brighton. We split an order of Koshary, a wonderful Egyptian dish with rice, macaroni, spaghetti, lentils, fried onions, and a spicy tomato sauce. We also split the green salad that came with it, and each had a cup of crushed lentil soup. The pocket bread was hot from the oven and the garlic spread was delicious, and it was all vegan. Yum. By the time we got home from the restaurant we were done working for the day. We relaxed for a while and then turned in to watch another episode of Doc Martin. This entry was posted in Family-Friends-Home, FMCA, Projects, RVillage, WFPB and tagged Ambassador Program (RVillage), crown preparation, crushed lentil soup (vegan), Dearborn (MI), Doc Martin (PBS), drawf weeping Norway spruce, Egyptian street food, FMCA national education committee, garlic spread, Gusfa Dental, Keith Kish Lawn Care, Koshary, La Marsa (Brighton MI), pocket bread, rain, RV Trip Wizard website, storm door lock set installation, Village Landscape Development (VLD), yardwork on 2014/06/23 by BRF. No, we have not been visiting religious resale shops. Today we drove US-98 west all the way to Pensacola, Florida to visit the Pensacola Naval Air Station (NAS). Along the way we stopped at the Panera in Sandestin again. The outlet mall shops were not open yet so there was very little traffic and not much of a crowd. We took 20 minutes to enjoy some coffee and a bagel before continuing on to Pensacola. The 100 mile trip was probably a little slower than taking I-10, but it was a leisurely, pleasant drive that allowed us to take in the coastal sights. Photographs from today are in a separate gallery post. As we got to the end of the bay bridge we did not see a sign for the Pensacola NAS so we picked our way through downtown and finally pulled into a Walmart parking lot where we put the address in our GPS. As soon as we resumed driving we saw a sign for the NAS and Museum and the GPS wanted us to take a different route. In this instance the signs won, although the GPS way would also have worked as the NAS has a front and rear entrance and our destination was closer to the rear entrance. Four of the six U. S. Navy Blue Angels in diamond formation. The Pensacola NAS is the U. S. Navy’s primary flight training facility and is home to the Naval Aviation Museum and The Blue Angels Navy Combat Fighter Flight Demonstration Squadron. The Blue Angels’ practice sessions on Tuesday and Wednesday are normally open to the public. They did not fly on Wednesday this week due to weather conditions so they flew today instead. The session was open to the public and the public showed up in large numbers. They started at 11:30 AM sharp (this is military stuff, after all) and flew for about one hour. The practice session consisted of the same maneuvers, in the same order, that make up the “show” The Blue Angels do almost every weekend somewhere in the country from mid-March through early November. They might repeat a maneuver or leave one out based on how the routine is going, how the equipment is performing, or the weather conditions. The security personnel also acted as “play by play announcers,” letting the audience in their section of the grandstands know what maneuver was coming next. While we were waiting for the practice session to start they also provided information about The Blue Angels, the NAS, and answered whatever questions people had. The gentleman in our section had spent 30 years as a Naval aviator and was very knowledgeable. He also had the right personality for working the crowd. When the flight demonstration was over we toured the Naval Aviation Museum. The museum is adjacent to the runways where the Blue Angels practice and is served by the same parking lot. While not as extensive as the Smithsonian Air and Space Museums or the Air Force Museum, it is an excellent facility with a superb collection of aircraft and artifacts focused exclusively on Naval flight operations. We took about three hours to wander through the exhibits, but you could easily spend two or three days here if you wanted to read every placard and study the displays more carefully. 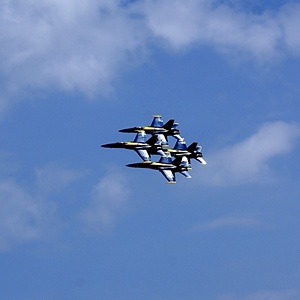 Admission to The Blue Angels practice session and the Naval Aviation Museum are both free. The museum has an IMAX theater, flight simulators, and other attractions that charge a fee. From BLSP we continued west to Perdido Key. Just past the entrance to Perdido Key SP was the Perdido Key Visitor and Community Center, which housed the Perdido Key Chamber of Commerce offices. Four miles down the road was the Alabama State line. Our reason for stopping here was that Jimmy and Sadie had mentioned that their daughter was the director of the Perdido Key Chamber of Commerce and we thought it would be fun to meet her. She was there (Tina Morrison) and we introduced ourselves and chatted for a few minutes. They pulled up the website for Bus Conversion Magazine on a computer and there was the Iron Horse on the cover! We got a nice map of the greater Pensacola area to help guide us back to I-10 using parkways on the west side if town, thus avoiding downtown during the late afternoon. The drive back on I-10 was through heavily wooded rolling terrain with light traffic. I was still tired from my night of no sleep earlier in the week and nodded off while Linda drove. After a simple dinner Linda read while I processed photos from yesterday and today. I updated a plug-in on all four of the WordPress sites I run and got my personal blog post for yesterday uploaded, but not the photographs. The rain started around 9 PM and quickly intensified. It did not take long for the bedroom vent-fan leak to re-appear. A powerful low pressure center south of Pensacola was pulling copious amounts of moisture north into Florida, Alabama, and Georgia. This was forecast to be a long-duration rain event, but without severe storms. River flood watches and warnings continued for the area along with urban flash flood warnings and high surf and rip current warnings for the coastal beaches. We decided to put a pot on the end of the bed to catch the drips from the leak and slept on the couches. I guess that’s a good reason to keep a sleeper sofa big enough for two when we redo the living room and dinette. This entry was posted in FL SP, Florida, Photography, RV-Travel and tagged Big Lagoon SP (FL), coastal beach communities, Destin (FL), Jimmy & Sadie Clay, Naval Aviation Museum (Pensacola), Panera, Pensacola (FL), Pensacola NAS (FL), Perdido Key (FL), Perdido Key SP (FL), rain, Sandestin (FL), Tina Morrison (Perdido Key CoC), U. S. Navy Blue Angels, US-98, Wordfence Security WP plug-in, WordPress on 2014/04/17 by BRF. We headed towards the seminar building for a 9 AM seminar on the Rand-McNally GPS unit. Along the way we stopped to chat with Lloyd De Gerald, an independant factory-trained Aqua-Hot technician. We attended Lloyd’s Aqua-Hot presentation at the FMCA rally in Gillette this past June. We have not had our Aqua-Hot serviced since the rebuilt unit was installed in 2009/10 and thought we would like to have him do our annual maintenance if we ever ran across him again. And here he was! So we signed up for an 11 AM service appointment today. We have one of the first Rand-McNally RVND7710 GPS units built. We pre-ordered it at the FMCA national rally in Madison, Wisconsin in August 2011 and received it in October 2011. It has been an excellent unit, but it has a lot features that we have not taken time to learn to use. I keep hoping I will pick up some useful tips at seminars but they are not necessarily the place to get such specific training. However, Techno RV (Phil and Tracey May) has produced an excellent set of tutorial videos which they make available via an e-mail newsletter even if you did not buy the unit from them. We did learn that the newest model, the 7720, has built-in WiFi which allows it to connect to a cell phone hotspot while traveling and thus acquire some additional real-time information; a nice feature. The price has also come down (of course) and now includes lifetime map updates (naturally). After the seminar we took a quick stroll through the vendor area. We stopped at the Blue Ox booth and signed up to have our Avanti II tow bar serviced as we have not had this done since we acquired it as part of the purchase of the Honda Element in the Spring of 2010. Directly across the aisle was the Harvest Hosts booth so we stopped to chat with the couple staffing it as Don and Kim Greene were not able to make it to this rally in person. We also chatted with the folks in the adjacent Always-Bright-And-Shiny booth. We purchased our built-in vacuum cleaner from them at a previous GLASS rally and also some of their aluminum wheel cleaning and polishing products. They had a really neat “2-burner” black glass top induction cook surface for sale. It is designed for a recessed installation, but could sit on a counter although it would be rather large. It was a 120 VAC device, although you could not run both heaters at full power at the same time. We started to run short of time so we returned to our coach to make sure we were they when Lloyd showed up. The weather forecast was for continued heavy thunderstorms and the radar confirmed significant weather headed our way, so we decided to put our Zip Dee Awnings up. Lloyd arrived on time just as it started to rain lightly. I fired up the Aqua-Hot so he could see and hear it start and then shut it down so could listen to that end of the cycle. By then it was raining harder and we decided that he would come back when the weather was a bit more agreeable. The view out our passenger side living room window. We had an early lunch and Linda put together plates of three different leftovers, all of which were excellent. Around 11:45 AM heavy thunderstorms moved into the fairgrounds with frequent lightening, thunder, and 2 inch per hour rainfall rates. This part of Indiana had not had rain in a while and needed it, but this was too much of a good thing as heavy rains tend to run off and swell creeks, streams, and rivers. A flash flood warning was issued for Elkhart County. We have a Silverleaf VMS Interface that works with the diagnostic connector for the Engine Control Computer (EEC) in our bus and plugs into a laptop computer running Silverleaf’s VMSpc software (Vehicle Monitoring System personal computer). I have never installed it because I haven’t figured out a good way to mount the laptop computer where I can see it but not have it in the way. I decided some time ago that the best solution would be to mount the computer and interface box remotely and install a secondary flat-panel monitor, which would give me more flexibility with respect to the mounting of both the computer and the monitor. I never finalized my decisions regarding mounting hardware and the flat-panel monitor, so this remains an unfinished/future project for now. The other seminar I planned to attend today was at 4 PM on designing and publishing websites. Unfortunately heavy rain continued off and on until around then, and I decided not to go. 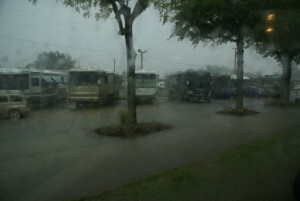 By 4:30 the sky had started to clear from the north and west, but we had several inches of standing water surrounding our coach and throughout the area of the fairgrounds where we are parked. I was curious to find out how long it would take for this water to disappear as it did not appear to have anywhere to go. The ground here was packed extremely hard when we arrived, to the point where we could not get sign wires pushed into it. While this area needed rain, we do not as a rule welcome inches of standing water substantially softening the ground under our tires. With the improved weather Lloyd returned around 5:15 PM as Butch and I were getting ready to leave to meet the pizza delivery person. I took a few extra minutes to talk to him. He had access to everything he needed in the bay so I left him to his work. We will catch up with him tomorrow and pay him. Not all vendors are this trusting, but in general we have found vendors at RV rallies willing to lend us a part, like an LED light bulb, to see if it will fit our coach on nothing more than the promise that we will bring it back or return and pay for it. Not all RVers are honest, of course, but we always feel very safe when we are at RV rallies. I went with Butch to help him with the pizzas, which arrived right on time. 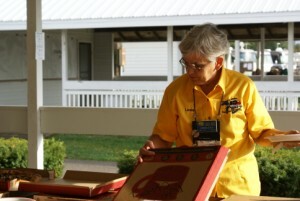 We drove them over to the pavilion and unloaded them along with soda pop, ice, and table settings. The GLCC gathering was well attended. Just as we were getting started FMCA national president Charlie Adcock and his wife Gloria stopped by with senior national vice-president Jon Walker (a member of our GLCC chapter). Jane Roush, GLAMA President also stopped by. They didn’t stay long as they had to visit all of the chapter meetings, but everyone appreciated them coming. Judy Czarsty, FMCA past national president, and her husband arrived a little while later and stayed through the end of the business meeting. Michele Henry of Phoenix Paint in Edwardsburg, MI attended as our guest, and Al Hesselbart, the historian at the RV/MH Museum and Hall of Fame in Elkhart, Indiana also stopped by. Folks stayed to talk for a while but eventually the numbers dwindled until there were only a few of us left to pack up and take things back to our rigs. Photos of the event are at the end of this post. Square dancing was scheduled for 6 PM, weather permitting, and card bingo was scheduled from 7 – 9 PM, but neither of these are activities in which we participate. Linda and Vicky went for a walk after the meeting. I got back to our coach around 8:30 PM and Linda returned around 9 PM. The ground was very wet but most of the standing water had already disappeared. 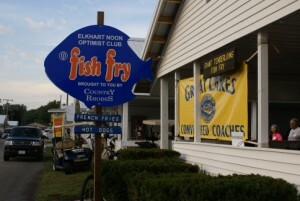 The Elkhart Noon Optimist pavilion where the GLCC social was held. L-2-R: Vicky Lintner, Jon Walker (FMCA Senior National Vice-President), Larry Baker (GLCC President). 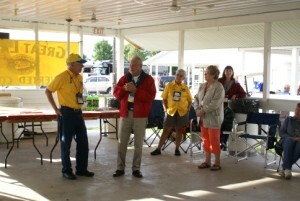 L-2-R: Larry Baker, Charlie Adcock (FMCA National President), Linda Fay (GLCC Treasurer, Gloria Adcock, Fonda Williams. Getting the food and pop ready for dinner. 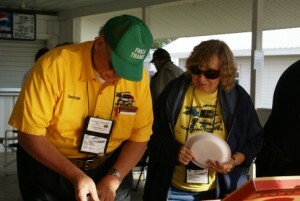 George and Sue Myers (GLAMARAMA shuttle service coordinators). Sue is the GLCC newsletter editor. 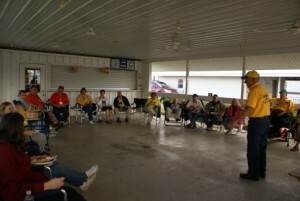 George is the GLCC immediate past president and is the current president of the Friends of Angel Bus chapter. GLCC president Larry Baker conducting the chapter business meeting. The GLCC business meeting in progress. 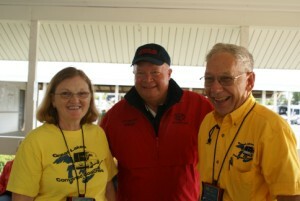 L-2-R: Larry Baker, Ron Walker, Judy Czarsty (FMCA past national president) and her husband. 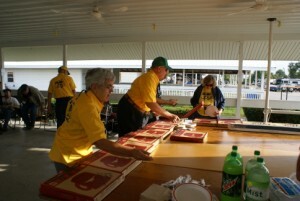 This entry was posted in RV-Travel and tagged Aqua Hot, Blue Ox tow bar, flood warning, FMCA past Nat President, FMCA President, FMCA Sr Nat VP, GLAMA President, GLCC, GLCC business meeting, GLCC social, Harvest Hosts, induction range, Lloyd De Gerald, Phoenix Paint (Edwardsburg MI), Pizza Hut, R-M RVND7710 GPS, rain, RV/MH Museum & HOF, Silverleaf VMSpc, Techno RV, website design/publishing on 2013/09/19 by BRF.